KeyNote NF is a handy application designed for organizing and storing multiple notes within one file. This means that you do not need to open several files - for most purposes it is enough to create only one and hold all your notes inside it. 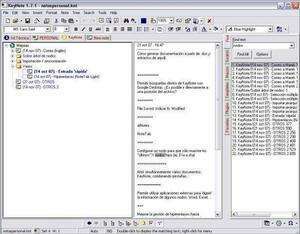 Due to the tree-type notes, you have a three-dimensional notebook: many notes within one file and a multi-level, nested pages within a single note. Optionally, KeyNote can encrypt your data securely using the Blowfish or Idea algorithms. Version 1.7.9 Beta 8 is a freeware program which does not have restrictions and it's free so it doesn't cost anything. For security reasons, you should also check out the KeyNote NF download at LO4D.com which includes virus and malware tests. Additional screenshots of this application download may be available, too. KeyNote NF download been highly rated by our users.